With the proper care, your granite or marble countertop will stay new-looking for years. Granite stone is one of the easiest surfaces to maintain and virtually un-scratchable. Below we have cleaning tips so that you can spend less time cleaning your stone countertops and more time enjoying them. If you have any questions or we can assist you in any way, please do not hesitate to contact Stone Cutters at 214-502-8029. For your convenience, you may also request services from this site. Blot up spills immediately, before they penetrate the surface. Clean stone surfaces with a few drops of neutral cleaner, stone soap or mild dishwashing liquid and warm water. Use a soft, clean cloth to clean the granite. Rinse after washing with the soap solution and dry with a soft, clean cloth. Remove a stain on granite, basing the method on the type of stain. Mix a cup of flour, 1-2 tablespoons of dishwashing liquid with water to make a thick paste. Put it on the stain, cover with plastic wrap, and let it sit overnight. Scrape away the mixture with a wooden utensil and rinse. If the stain is oil-based (e.g. grease, oil, milk), use hydrogen peroxide in the paste instead of dishwashing liquid or try ammonia on it. Try a mixture of 12 percent hydrogen peroxide mixed with a couple drops of ammonia for an organic stain (e.g. coffee, tea, fruit). Use a lacquer thinner or acetone to remove ink or marker stains from darker stone. On light-colored granite, use hydrogen peroxide to these stains. This also works for wine stains. Mix molding plaster and pure bleach into a paste and spread over a wine, ink or other non-oil stain. Leave on for 30 minutes, then remove and rinse. Paste a mix of molding plaster and water over an oil-based or fat-based stain. Mold it into a birds-nest shape and allow to stand for 3 hours. Remove and rinse. Reseal the countertop every year or two years. Check with the installer for recommendations. Use a non-toxic sealer on food preparation areas. Consider using a new disinfectant cleaner made specifically for granite. 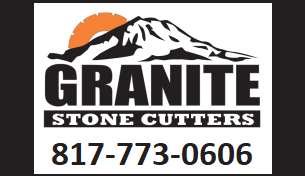 Call Stone Cutters for problems that appear too difficult to treat. If you have any questions or we can assist you in any way, please contact Stone Cutters at 214-502-8029. For your convenience, you may request services from this site. Kitchen & Bathroom Granite Countertop Installation in the North Texas area. We would like to thank you for your interest in Stone Cutters. We look forward to serving you in the near future! Proudly Serving the North Texas Area. Stone Cutters is proud to service the North Texas area including the cities of Allen, Anna, Blue Ridge, Carrollton, Celina, Copeville, Fairview, Farmersville, Frisco, Josephine, Lavon, Lowry Crossing, Lucas, McKinney, Melissa, Murphy, New Hope, Parker, Plano, Princeton, Prosper, Richardson, Royse City, Saint Paul, Van Alstyne and Weston.